Horseshoe crab is the common name for various marine chelicerate arthropods of the family Limulidae, and in particular the extant species Limulus polyphemus of the Atlantic of North America. The other extant species known as horseshoe crabs are the Indo-Pacific species Tachypleus gigas, Tachypleus tridentatus, and Carcinoscorpius rotundicauda. Horseshoe crabs are characterized by a heavy, domed, horseshoe-shaped carapace, a pointed, spiky telson ("tail"), a jawless mouth, and the presence of compound eyes. Despite the name, horseshoe crabs are more closely related to spiders and scorpions than to crabs. Beneath the carapace, they look similar to a large spider. Horseshoe crabs have a long fossil record and these "living fossils" have hardly changed over the last 445 million years; the modern horseshoe crabs look almost identical to prehistoric genera, such as the Jurassic Mesolimulus. Ecologically, horseshoe crabs are important in marine food chains. They consume invertebrates such as mollusks, worms, crustaceans, and small fish, and are preyed upon by many species of fish and birds, as well as sea turtles and sharks. At least twenty species of migratory shore birds depend on horseshoe crab eggs as their primary source of fat (MRRI). For humans, horseshoe crabs are uniquely valuable in medicine and research. The immune system of L. polyphemus yields an agent in the blood that is collected and used to detect microbial pathogens in intravenous fluids, injectable drugs, and supplies (MRRI). Limulus also is used in research into the physiology of vision and the development of wound dressings and surgical sutures (MRRI). Their use as bait in fishing for eels and whelks has come under criticism because of declining numbers of horseshoe crabs, affecting other marine populations. The mouth opening is between the legs, the gills are visible below. Horseshoe crabs differ from true crabs in that they lack antennae and jaws (true crabs have two pairs of antennae and a pair of jaws) and they have seven pairs of legs, including a pair of chelicerae (true crabs have five pairs of legs). The following is a description of the well-known Atlantic horseshoe crab, Limulus polyphemus. However, all four extant species are similar in form and behavior. Horseshoe crabs can be divided externally into three parts. The frontmost part, the prosoma (cephalothorax), is covered by smooth carapace on the dorsal surface, which is roughly shaped like a horse's shoe. This section contains the eyes (five pairs), one pair of small pincers/chelicerae used to move food towards the mouth, five pairs of walking legs (the first four with claws, the last with a leaf-like structure used for pushing) (DNR 2005), the mouth (located in between the legs), the brain, and the heart. The middle section is the abdomen or opisthosoma, which connects to the prosoma via a hinge. It is this portion where the gills are attached as well as the genital operculum. The last section is the telson (i.e., tail or caudal spine), which attaches to the abdomen and is used to steer in the water, as well as to flip the horseshoe crab over if stuck upside down. The horseshoe crab can grow up to 60 centimeters (24 inches) in length (including tail); the female is typically 25 to 30 percent larger than the male (Angier 2008). 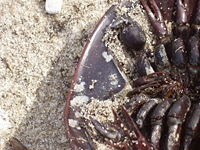 The hard carapace that protects the body of the horseshoe crab is dark brown. Horseshoe crabs possess five pairs of book gills, located just behind their appendages. These allow them both to breathe underwater, and for short periods of time even on land, provided the gills remain moist. In addition to the exchange of respiratory gases, the book gills are occasionally used for swimming. Although most arthropods have mandibles, the horseshoe crab is jawless. The mouth is located in the middle of the underside of the cephalothorax, with chelicerae located at each side of the mouth. Horseshoe crabs have five pairs of legs for walking, swimming, and moving food into the mouth, located just before the book gills. In the female, the four large legs are all alike, and end in pincers. In the male, the first of the four large legs is modified, with a bulbuous claw that serves to lock the male to the female while she deposits the eggs and he waits to fertilize them. Horseshoe crabs have ten eyes. They have two large compound eyes, each with about 1,000 receptors or ommatidia, and with each ommatidium feeding into a single nerve fiber. There are five additional eyes on the top side of its prosoma, two ventral eyes located near the mouth, and photoreceptors located on the telson that constitute the last eye (DNR 2005). Among other senses, they have a small sense organ on the triangular area formed by the exoskeleton beneath the body near the ventral eyes. The blood of horseshoe crabs, as with the blood of most mollusks, including cephalopods and gastropods, and the blood of some arthropods, contains the copper-containing protein hemocyanin. These creatures do not have hemoglobin (iron-containing protein), which is the basis of oxygen transport in vertebrates. Hemocyanin is colorless when deoxygenated and dark blue when oxygenated. The blood in the circulation of these creatures, which generally live in cold environments with low oxygen tensions, is gray-white to pale yellow, and it turns dark blue when exposed to the oxygen in the air, as seen when they bleed (Shuster et al. 2004). This is due to change in color of hemocyanin when it is oxidized (Shuster et al. 2004). Hemocyanin carries oxygen in extracellular fluid, which is in contrast to the intracellular oxygen transport in mammals by hemoglobin in red blood cells (Shuster et al. 2004). Horseshoe crabs possess the rare ability to regrow lost limbs, in a manner similar to sea stars (Edgecomb 2002). The Atlantic horseshoe crab (Limulus polyphemus) is most commonly found in the Gulf of Mexico and along the northern Atlantic coast of North America. A main area of annual migration is the Delaware Bay, although stray individuals are occasionally found in Europe (Hansson 1998). The Japanese horseshoe crab (Tachypleus tridentatus) is found in the Seto Inland Sea, and is considered an endangered species because of loss of habitat. Two other species occur along the east coast of India: Tachypleus gigas and Carcinoscorpius rotundicauda (Tripathy 2006). Horseshoe crabs typically are found in shallow water on soft sandy bottoms. While they can swim upside down, members of L. polyphemus usually are found on the ocean floor searching for worms and mollusks (such as razor clams and blue mussels), which are their main food. They also feed on annelids, nematodes, polychaetes, crustaceans, and other benthic invertebrates, including small fish. Lacking jaws, a horseshoe crab grinds up the food with bristles on its legs and a gizzard that contains sand and gravel (Angier 2008). Horseshoe crabs (L. polyphemus) spend the winters on the continental shelf and emerge at the shoreline in late spring to spawn, with the males arriving first. The smaller male grabs on to the back of a female with a "boxing glove" like structure on his front claws, often holding on for months at a time. After the female has laid a batch of eggs in a nest at a depth of 15 to 20 centimeters in the sand, the male fertilizes them with his sperm. Egg quantity is dependent on female body size and ranges from 15,000 to 64,000 eggs per female (Leschen et al. 2006). The egg cover splits and a new transparent capsule is formed. After hatching, the larva swim for about five to seven days, and then settle. They begin the first molt after twenty days after formation of the egg capsule. As young horseshoe crabs grow, they move to deeper waters, where molting continues. They reach sexual maturity in approximately eleven years and may live another ten to 14 years beyond that. Before becoming mature around age nine, they have to shed their shells some 17 times (Angier 2008). Horseshoe crabs are distant relatives of spiders and are probably descended from the ancient eurypterids (sea scorpions). They evolved in the shallow seas of the Paleozoic era (542-251 million years ago) with other primitive arthropods like the trilobites. 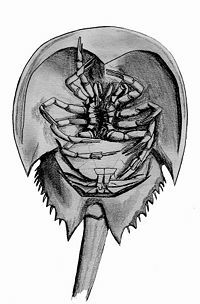 The extinct diminutive horseshoe crab, Lunataspis aurora, four centimeters (1.6 inches) from head to tail-tip, has been identified in 445-million-year-old Ordovician strata in Manitoba (Bryner 2008). It likewise is placed in the Limulidae family. Horseshoe crabs are often referred to as living fossils, appearing similar over these last 445 million years (Angier 2008). Traditionally, horseshoe crabs have been placed in the class Merostomata, a group of marine Chelicerata that includes horseshoe crabs and eurypterids. Recent taxonomies have favored the abandonment of the term Merostomata, in favor of splitting members of this group into two classes, Xiphosura and Eurypterida. This is because Merostomata is thought to be paraphyletic, with the Eurypterida more closely related to the Arachnida, forming the group Cryptopneustida (Boudreaux 1979). This change has not been incorporated into most textbooks, which typically use the traditional Merostomata without reference to the Eurypterida. The Merostomata are the only chelicerates to possess compound eyes; the arachnids have lost the ancestral arthropods' fully developed latero-anterior compound eyes. Xiphosura is sometimes seen as an order under Merostomata, but in more recent taxonomies is considered a class, with Xiphosurida listed as the order within Xiphosura that includes the Limulidae family of horseshoe crabs. Limulidae is the only recent family of the order Xiphosurida and contains all the four living species known of the taxon Xiphosura. The Atlantic horseshoe crab, Limulus polyphemus, also is known as horsefoot, king crab, or sauce-pan. Many people refer to the horseshoe crab as a "helmet crab"; however, this is a common misconception. Former scientific names include Limulus cyclops, Xiphosura americana, and Polyphemus occidentalis. Limulus means "odd" and polyphemus refers to the giant in greek mythology (Heard 2001). Horseshoe crabs (Limulus polyphemus) are valuable as a species to the medical research community. The horseshoe crab has a simple but effective immune system. When a foreign object such as a bacterium enters through a wound in the animal's body, a substance called Limulus Amebocyte Lysate (LAL) almost immediately clots into a clear gel-like material, effectively trapping the foreign body. LAL is used in medicine to test for bacterial endotoxins in pharmaceuticals and for several bacterial diseases (Heard 2001). If the bacterium is harmful, the blood will form a clot. Horseshoe crabs are helpful in finding remedies for diseases that have developed resistances to penicillin and other drugs. Horseshoe crabs are returned to the ocean after having been bled for this purpose. Studies show that blood volume returns to normal in about a week, though blood cell count can take two to three months to fully rebound (Novitsky). A single horseshoe crab can be worth US$ 2,500 (2008 statistics) over its lifetime for periodic blood extractions. The compound eyes of horseshoe crabs are likewise important for research. The rods and cones the compound eyes have a similar structure to those found in human eyes, but are around 100 times larger in size (DNR 2005). Furthermore, each compound eye has about 1,000 receptors or ommatidia, each with their own nerve, and these nerves are large and relatively accessible. This has made it possible for electrophysiologists to record the nervous response to light stimulation easily, and to observe visual phenomena like lateral inhibition working at the cellular level. Limulus polyphemus is not presently endangered, but harvesting and habitat destruction have reduced its numbers at some locations and caused some concern for this animal's future. Since the 1970s, the horseshoe crab population has been decreasing in some areas, due to several factors, including the use of the crab as bait in whelk and conch trapping. Conservationists have also voiced concerns about the declining population of shorebirds, such as red knots, which rely heavily on the horseshoe crabs' eggs for food during their spring migration. Precipitous declines in the population of the red knots have been observed in recent years. Predators of horseshoe crabs, such as the currently threatened Atlantic loggerhead turtle, have also suffered as crab populations diminish (Eilperin 2005). ↑ World Conservation Monitoring Center (1996). Angier, N. 2008. Tallying the toll on an elder of the sea New York Times June 10, 2008. Retrieved September 20, 2008. Botton, M. L., and J. W. Ropes. 1987. The horseshoe crab, Limulus polyphemus, fishery and resource in the United States. Marine Fisheries Review 49(3): 57-61. Boudreaux H. B. 1979. Arthropod Phylogeny With Special Reference to Insects. New York: John Wiley. ISBN 0471042900. Bryner, J. 2008. Ancient horseshoe crabs get even older Fox News January 30, 2008. Department of Natural Resources (DNR). 2005. Anatomy of the horseshoe crab Maryland Department of Natural Resources. Retrieved September 20, 2008. Ecological Research and Development Group (ERDG). n.d. The horseshoe crab natural history: Crab species ERDG. Retrieved September 20, 2008. Edgecomb, M. 2002. Horseshoe crabs remain mysteries to biologists Bangor Daily News (Maine) June 21, 2002. (Republished in National Geographic News) Retrieved September 20, 2008. Eilperin, J. 2005. Horseshoe crabs' decline further imperils shorebirds: Mid-Atlantic States searching for ways to reverse trend Washington Post June 10, 2005, page A03. Retrieved September 20, 2008. Hansson, H. G. (Comp.). 1998. NEAT (North East Atlantic Taxa): South Scandinavian marine and maritime Chelicerata and Uniramia. Checklist Tjarno Marine Biological Laboratory. Retrieved September 20, 2008. Heard, W. 2001. Coast Project Oceanography. Retrieved September 20, 2008. Leschen, A. S., S. P. Grady, and I. Valiela. 2006. Fecundity and spawning of the Atlantic horseshoe crab, Limulus polyphemus, in Pleasant Bay, Cape Cod, Massachusetts, USA Marine Ecology 27: 54-65. Retrieved September 20, 2008. Marine Resources Research Institute (MRRI). n.d. Horseshoe crab South Carolina Department of Natural Resources. Retrieved September 20, 2008. Novitsky, T. J. n.d. Medical uses Ecological Research and Development Group. Retrieved September 20, 2008. Shuster, C. N. 2004. M1 Chapter 11. A blue blood: The circulatory system In C. N. Shuster, R. B. Barlow, and H. J. Brockmann, The American Horseshoe Crab. Harvard University Press. ISBN 0674011597. Tripathy, B. 2006. 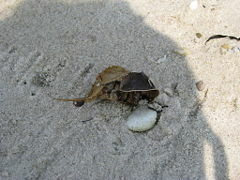 The status of horseshoe crab in east coast of India Wildlife Institute of India. Retrieved September 20, 2008. World Conservation Monitoring Centre. 1996. Limulus polyphemus 2007 IUCN Red List of Threatened Species. Retrieved September 20, 2008. This page was last modified on 9 December 2008, at 15:23.